Joseph Craig Colquitt (born June 9, 1954) is a former American football punter who spent eight seasons in the National Football League (NFL) with the Pittsburgh Steelers (1978–1981, 1983–1984) and Indianapolis Colts (1987). 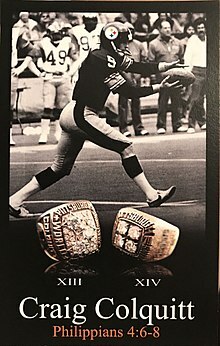 He was a member of two Super Bowl Champions with the Steelers in 1978 and 1979. He is the father of two current NFL punters, Dustin and Britton Colquitt. His brother, Jimmy Colquitt, was a punter for the Seattle Seahawks in 1985. All four played college football at the University of Tennessee. Craig was inducted into the Greater Knoxville Hall of Fame July 16, 2009. Craig Colquitt is also the author of the children's book: "JoJo! What Happened To Your Hair?". ^ "The Punting Colquitt Brothers Are Keeping Alive a Family Pedigree in the N.F.L.," The Associated Press, Saturday, November 13, 2010. This page was last edited on 22 January 2019, at 15:44 (UTC).